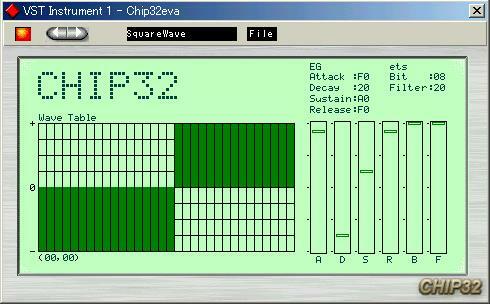 Chip 32 is a wavetable softsynth created by Sam and ported to linux by the Jucetice team at Anticore.org. It responds to realtime midi control, and provides 8-bit wavetables, for "chiptune"-type music. The demos above are of the four common waveshapes: sine, saw, triangle and square. In each demo, the filter amount is modulated from one extreme to the other, and then the bit depth/width is modulated. 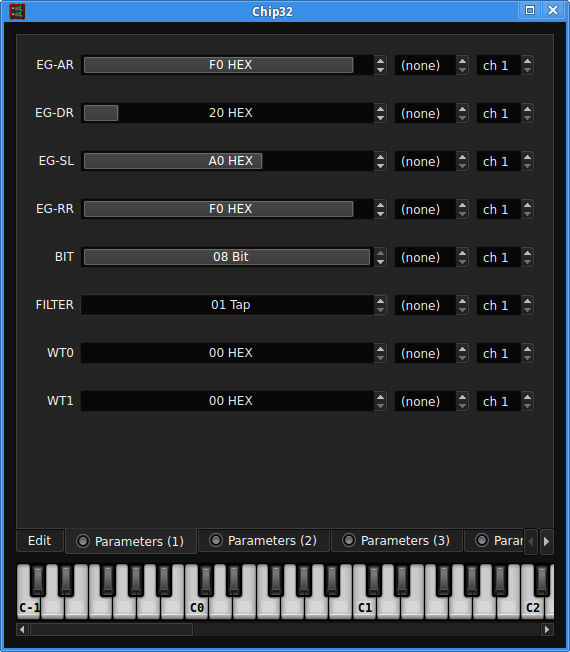 The first screenshot above is of the original synth GUI. The version ported to linux does not include a GUI, so it quite usable in a plugin host such as Carla (Chip 32 is shown in Carla in the second screenshot). The various synth parameters can be explained as follows: the first four parameters are the standard amplitude ADSR settings. The "B" slider controls the bit depth (roughness). The "F" slider is the filter setting, which controls how many times that the wave is filtered. The left side of the GUI is where the waveshape can be drawn. (In Carla, there are 32 dedicated sliders for these settings.) The original GUI screenshot above shows a square wave. In Carla, the settings (in hex) are between 00 (maximum negative setting) and FF (maximum positive setting), with 80 as the zero point.